In a show of bipartisan support for clarity around marijuana laws, Democratic Sen. Elizabeth Warren of Massachusetts and Republican Sen. Cory Gardner of Colorado held a joint press conference about a bill they are sponsoring to allow states to make their own decisions regarding marijuana legislation. Massachusetts and Colorado are two of a growing number of states to have legalized recreational use of marijuana, and Warren said that 46 states and the District of Columbia have legalized some aspect of marijuana. And yet, federal law still outlaws marijuana, making for some murky legal territory around the marijuana industry. 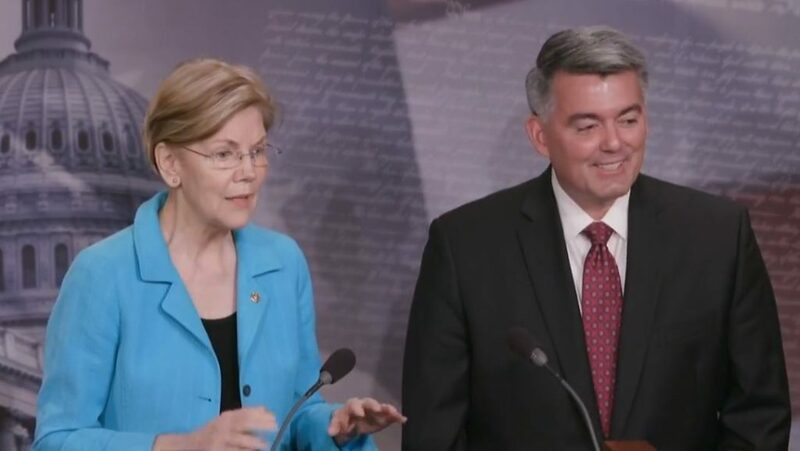 Gardner and Warren announced that the Strengthening the Tenth Amendment through Entrusting States Act, known as the STATES Act, would fix the banking issue, allow for proper taxation, and would allow states where voters have approved marijuana legalization efforts to operate in a federally legal fashion. Full text of the bill can be viewed here. Warren said that she and Gardner are working to get an equal number of Democrats and Republicans on board with their bill. “We’re lining them up like Noah’s Ark; they come on two by two,” Warren said. U.S. Representatives David Joyce (R-Ohio) and Earl Blumenthal (D-Oregon) are introducing identical legislation to the House, according to a press release. Asked whether President Donald Trump would sign the bill into law, Gardner said he had recently spoken to the president and that he was confident Trump would support a state-based solution. Warren said a recent decision by Attorney General Jeff Sessions to end the Obama-era policy of not enforcing federal marijuana law in states that passed their own laws around cannabis was a catalyst. Congress passing its own law is better than having a Justice Department policy on enforcement of specific laws, she said. Dave Eisenstadter can be reached at deisen@valleyadvocate.com.